The town of Basildon is located in the county of Essex, 26 miles east of London. It also gives its name to the Borough which includes the nearby towns of Wickford and Billericay. The correct pronunciation is bæzildon. Basildon was originally designated a 'New Town' following the New Towns Act of 1946. This was officially confirmed in 1949 and a Government appointed Basildon Development Corporation was formed and given the task of transforming the designated area into a modern town. The pre-existing towns of Laindon, Pitsea and Vange, together with Lee Chapel and parts of Dunton, Langdon Hills and Nevendon were all absorbed into the new development. Up until development began Basildon had been little more than a small rural village with a scattered population in 1931 of just 1,159. Basildon was created primarily as an 'overspill' town to relieve the overpopulated areas of east London, and also to provide essential services and modern accommodation for the existing population of over 22,000, of which many were living in properties below the Housing Act standard. By 1951 the first new tenants moved into newly completed homes in Redgrave Road, Vange. Development continued throughout the 1950s, '60s, '70s and into the 1980s when the development corporation was finally wound up. The town has continued to transform with many new additions in recent years like the Festival Leisure Park and The Icon apartment block as well as the new Sporting Village which boasts the only 50 metre swimming pool in Essex. Basildon is no longer referred to as a 'new town' and having passed its 60th birthday looks ahead to the future with much promise. The town is bisected by the direct London (Fenchurch Street) to Shoeburyness rail route with stations at Laindon, Basildon and Pitsea, which is also the junction for Tilbury and Grays. Services are operated by C2C. The Basildon district is served by a number of different bus operators. These include Arriva, First, Clintona and Wickford based Nelson's Independent Bus Services (Nibs). Basildon is served by two primary routes; the A127, which borders the town on the northern extremity and the A13, which for the most part skirts the southern housing developments of Vange. Both roads connect the town with Southend-on-Sea and the London orbital M25 motorway. The A127 is also called Arterial Road and continues beyond the M25 junction into the London Borough of Havering where it becomes the A12 following the Gallows Corner flyover. The A13, which begins in east London, is also the most direct route for the Thurrock Lakeside shopping complex. The population statistics for Basildon, which includes Laindon, Langdon Hills, Pitsea and Vange are: 107,123 (Source: 2011 Census). The overall population of the Basildon Borough which includes Billericay, Bowers Gifford, Crays Hill, Great Burstead, Little Burstead, North Benfleet, Ramsden Bellhouse, Shotgate and Wickford is 174,500 (Source: 2011 Census). The population of Essex at the time of the last Census count on 27th March, 2011 was 1,393,600. Basildon is the largest populated borough in the county and covers an area of 42.5 square miles (110.02 kilometres). 70% of the district is rural with much of this designated as open farmland. There are eight parish and town councils in the Basildon Borough. These are: Billericay, Bowers Gifford & North Benfleet, Great Burstead & South Green, Little Burstead, Noak Bridge, Ramsden Bellhouse, Ramsden Crays and Shotgate. To the east it borders the District of Rochford, to the west it borders the Borough of Brentwood, to the south the borough has a boundary with the Unitary Borough of Thurrock and in the south east it borders the Borough of Castle Point and to the north it borders the Borough of Chelmsford. Basildon was first mentioned in the Domesday survey of 1086 as Berlesduna and being in the Barstable Hundred, but for centuries was little more than a small village before being designated a new town. Its small population was mainly centred around the area of Church Road, close to Holy Cross Church. Variant spellings of Basildon through the years have included: Batlesdon, Basseldon and Bassendon. The name Basildon is of Saxon origin meaning Beorhtel's Hill. It covers an area roughly 7.818 acres. The highest point is at Langdon Hills, notable also as the second highest point in Essex at 384 feet (117.0432 metres) above sea level and the lowest point at 5 feet (1.52400 metres) is at Bowers Gifford marshes. Basildon - Dunton - Laindon - Langdon Hills - Nevendon - Pitsea - Vange. Click the link below or anywhere on the image of Brooke House. 1855 - Pitsea Railway Station opened. 1888 - Laindon Railway Station opened. 1925 - The first Pitsea Market opened. 1949 - Basildon is officially designated a 'new town'. 1953 - 1,000th new home built at Denys Drive, Fryerns. 1955 - The urban district council changes from Billericay to Basildon. 1957 - Gloucester Park parkland opened. 1958 - First Town Centre shops and Basildon Market opened. 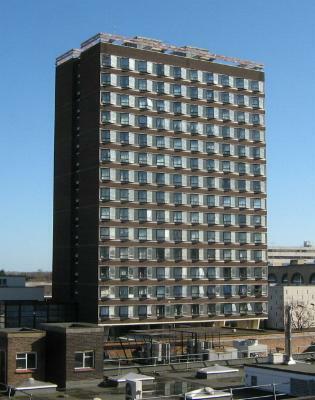 1962 - Brooke House, the town's tallest building completed. 1962 - Mother and Child Fountain in Town Square unveiled. 1971 - Marks and Spencer opened. 1973 - Basildon Hospital opens. 1974 - Basildon Railway Station opened. 1980 - Phase I of Eastgate Indoor Shopping Centre completed. 1984 - Wat Tyler Country Park in Pitsea opened. 1986 - Basildon Development Corporation wound up. 1989 - The Basildon Centre in St. Martin's Square opened. 1997 - Festival Leisure Park opened. 1999 - Westgate Shopping Park opened. 2008 - The Icon luxury apartment block in Southernhay completed. 2010 - Basildon District Council becomes Basildon Borough Council. 2011 - Basildon Sporting Village opened. Brooke House, Town Centre, Basildon. Designed by Anthony B. Davies, F.R.I.B.A. Minister for Housing - 1957-1961. Basildon town centre is a large pedestrianised shopping precinct purposely designed to eliminate vehicle traffic movements. The main Town Square has over 30 shops including Marks & Spencer, WH Smith, Primark, British Home Stores and many more. At the eastern extremity is a large Toys R Us store while at the western end is the Westgate Shopping Park where you will find among others Argos and Wilkinson. Undercover shopping is the main feature of the Eastgate Centre - home to Debenhams department store, H.M.V., Asda and a host of other top retail names. At Pitsea is Tesco Extra, and there are also a number of out of town retail parks like Pipps Hill and Mayflower. The town also has two markets. Basildon, which operates every Tuesday, Thursday, Friday and Saturday, and Pitsea, which operates every Wednesday, Friday (second hand only), Saturday and Sunday. Located in the north of the town off Cranes Farm Road is the Festival Leisure Park. Attractions began opening in 1997 and now include a 12 screen cinema, David Lloyd health and fitness club, Hollywood Bowl, New York New York, Jumpin Jaks (now JJ's), Liquid, Envy, McDonald's, Pizza Hut, Fitness First, TGI Friday's American bar and restaurant, a Travelodge Hotel and many more. The leisure park is affectionately known locally as Bas Vegas. The Towngate Theatre located in St. Martin's Square provides a wide range of entertainment that includes theatrical productions and live attractions from popular groups to stand-up comedy. The main auditorium has seating for over 550 and the Mirren Studio seats 150 though both figures can be comfortably exceeded when used in flat floor configuration. There are four main industrial estates, or enterprise parks as they are now known, in the town. These are at Burnt Mills, Nevendon, Pipps Hill and Southfields. Two small estates exist at Laindon. Motor vehicle manufacturer Ford continue to have a strong presence in the town with a Technical Centre and test track at Dunton. Case New Holland provide employment for a large workforce at their tractor plant based at Cranes Farm Road and general goods retailer Argos located to a new purpose built distribution centre at Pipps Hill. Gloucester Park is the largest park with an area covering around 250 acres. Situated at the northern end is the Basildon Sporting Village where indoor facilities include a 50 metre international size swimming pool, large sports hall, a regional gymnastics centre, fitness centre, multi purpose studio, climbing wall and a café. Amongst the outside attractions are an athletics stadium, six floodlit five-a-side artificial pitches, twelve national standard netball courts, cricket and football pitches and a fishing lake. Other parks and recreation grounds within Basildon include Northlands, Howard Jubilee, Mopsies, Whitmore, Swan Mead, Langdon Hills and Holy Cross, which is also the venue for the annual firework display. Countryside walks can be enjoyed in over 450 acres of Nature Trail beginning at Dunton Hills in the south-west corner, continuing through the woodland of Lincewood to Marks Hill and finally to Willow Park. Langdon Hills Country Park with its views of the Thames and beyond is another popular attraction, as is the Wat Tyler Country Park at Pitsea. Set in 125 acres of unspoilt countryside, the park boasts an adventure playground, marina, art and craft shops, sculpture trail, tudor houses, visitor centre and a 10.25" miniature narrow gauge railway. Basildon also has an 18 hole municipal golf course covering 164 acres. Basildon, TQ735895; Laindon, TQ676888; Langdon Hills, TQ679875; Pitsea, TQ735885. Since 2010 Basildon has elected two members of parliament. Stephen Metcalfe (Conservative) represents the Basildon South & Thurrock East constituency and John Baron (Conservative) represents the Basildon & Billericay constituency. The borough also has 42 publicly elected councillors. The current encumbent Mayor is Councillor David Harrison. Since 1999 the Basildon Borough area now falls within the East of England European Parliamentary constituency represented by the Labour M.E.P. Richard Howitt. Postcodes covering the Basildon area: SS13, SS14, SS15 and SS16. Dialling code for the Basildon area: 01268. Basildon is twinned with Heiligenhaus in Germany and Meaux in France and has an international relationship with Gweru, a city in Zimbabwe. If you require contact information for some of the local services and amenities available, you might find the Basildon Resources webpage useful. There is also a Site Map to help with navigation. This domain name and website, otherwise known as Basildon.Com, is privately owned and maintained and is not affiliated in any way with any local authority or borough council. Text researched and written 2005 with revisions 2006-2011. Copyright © 2005-2011, B. Cox - Basildon History Online. All rights reserved. Copyright © Basildon.Com - (BASILDON.CO.UK) 1998-2019. All rights reserved.